$5,000-$7,000? $1200-$1500? $868? What should it cost to remove a simple skin cancer? What if you can’t find out? Long-time readers know that in 2012 I was on high deductible insurance – and I don’t mean Obamacare-style $3,000 deductible, I mean $10,000 deductible. I chose that gladly, because I had laboriously analyzed the five plans available to me. I know insurance is a game of sharing risks, so I analyzed (it took all my Excel skills) and chose. 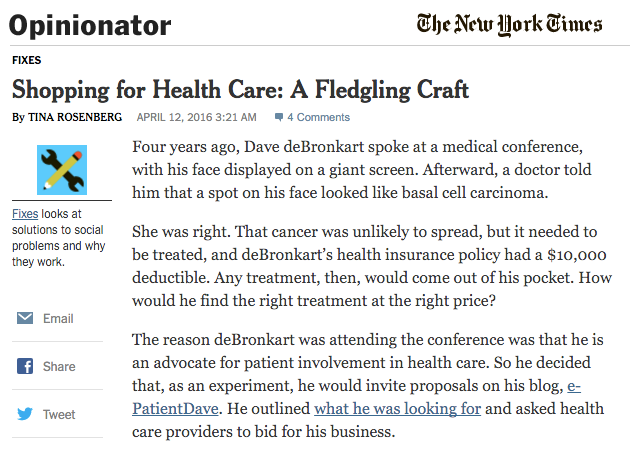 What happened next is described in a column in today’s NY Times by Tina Rosenberg, Shopping for Health Care: A Fledgling Craft: within months I discovered I had a skin cancer on my face. I became a highly motivated shopper, and quickly discovered nobody could tell me what would be on my bill. The details are in several skin cancer posts here. But Tina Rosenberg writes about social problems, and I want to draw attention to the nature of this social problem: it withholds power from the person whose health is at stake, and that’s just plain wrong. into effective actions and outcomes. When someone has a problem and no information, it decreases their capacity to make choices – it’s disempowering, and in my view that’s unjust. I urge all readers (that would be you) to start telling both their providers and their insurance companies that they want to know, in advance. I think until the individual clerks and clinicians and phone people start hearing us complain every day, there will be no pressure on them to open up. I have just one thing to add to Tina’s piece: have a look at ClearHealthCosts (CHC). They publish at least one source of reference prices – Medicare reimbursement rates in your area, which (even if you’re not on Medicare) shows what providers are willing to accept. Perhaps more important, in some cities CHC has done old-school phone journalism and accepts crowdsourced information on what we consumers actually paid when we ignored insurance and paid cash, direct. As the site shows, it often reveals a 5-10-fold price variation, and the best price is often less, sometimes much less, than the copay would have been! I’ll leave it to you to wonder where the heck the rest of the money is going in the “usual and customary” pricing that we hear about. I am sick to death of hearing that patients make lousy consumers. and go elsewhere when we get mad. Then we’ll see who’s a competent consumer. Without those conditions, such accusations are abusive. 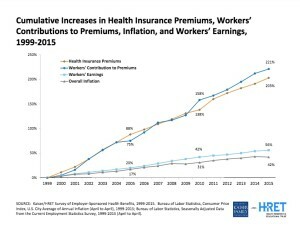 One last thing: today’s column also didn’t mention the absolutely classic article about health pricing in America, from 2006: “The Pricing of US Hospital Services: Chaos Behind a Veil of Secrecy.” If you need a basic education about the subject, see these slides. The example at right starts in the Clinton administration, spans Bush’s eight years and into Obamacare. Somehow, somewhere, the fix is in. Dave, glancing at the first slide, I’m curious if you are aware of, know anything about, and have formed an opinion about ColoradoCare, the ballot issue Coloradans *will* vote on this fall regarding the establishment in this state of a universal health care system? Several years ago when I needed to get a colonoscopy, I tried to find out what it would cost. It was next to impossible. Fortunately, I was in no rush, and I eventually managed to wrestle an answer out of the two providers I was considering–and a semblance of an answer out of the insurance company. But it was a nightmare. It does seem odd that you can check the cost of just about every other thing or service you want to purchase…but not health care. Outstanding article Dave. As always, thanks for presenting this from the patient perspective. I look forward to the day when we have moved the needle on some of these issues. Awareness first but I hope it leads to action. Hi Susan – sorry for not releasing it yesterday – somehow I only saw it now! Thanks for the kind words.